This content is part of the Winter 2019 Beacon Magazine: The Resolve Issue. Read more from the issue here. Alison Houck, CPA, is a managing partner at Faw Casson, a Beebe Ambassador, and a member of the Finance Committee for the Beebe Medical Foundation. She is also a Beebe baby! In the summer of 2017, she began a transformational fitness and lifestyle journey, and is inspiring others to do the same. 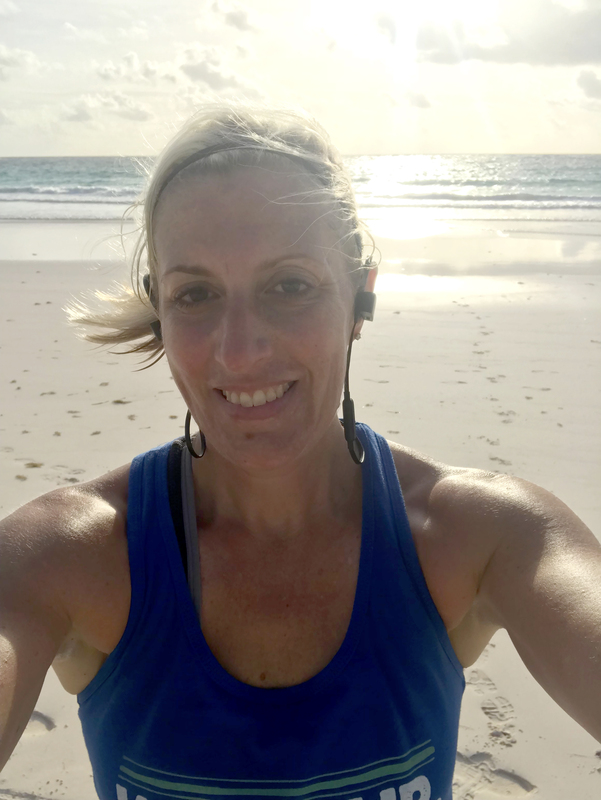 Here, Alison shares how she got started, what keeps her motivated, and her advice for others looking to get started on a fitness journey of their own. What motivated you to beginning your fitness journey? I was involved in cheerleading growing up, but I was never a runner or involved in competitive sports. I taught group fitness classes for 15 years, and during that time I signed up for a marathon through the Leukemia & Lymphoma society in 2002. I also ran a couple of half marathons. In the last couple of years, I found I wasn’t getting to the gym as much. I was at this amazing point in my life and had reached so many of my goals, but I didn’t feel good about myself. I’m not all about being skinny, but I wanted to feel fit and feel good. I enjoyed fitness, but it was all about my job, my kids, and other activities, and I just wasn’t making it to the gym. I reached out to Chris Antonio, a local trainer who has a 12-week transformation program. Chris’s program got me back in the fitness mindset and gave me someone to be accountable to. After the holidays were over, I signed up for another round. I wanted to give myself something to stay focused on during the winter and during tax season. What is your routine in terms of diet and exercise? I set aside time to exercise and put it on my calendar. Often, that means going to the gym or for a run at 5 a.m. By getting up and taking care of yourself in the morning, it sets the tone for the day. Flexibility is important, too. If I need to take my kids to cross country practice, then I’ll run in the afternoon. Meal prep is also big in our house, and eating out less allows my family to make healthier choices. When I do eat out, I’ll ask to have a dish prepared in a healthier way, maybe without butter. I’ve found that restaurants around here are very accommodating, and we’re so lucky to have so many places locally that offer fresh seafood, chicken, and lean meats. Surrounding myself with like-minded people keeps me motivated and accountable. Everyone I see at the gym at 5 a.m. is there for the same reason – they’ve made a choice to make themselves better, and that’s the only time they have to do it. My family and my boyfriend Tim, have been amazing. We balance each other out – I usually work out in the morning, and he works out in the afternoon. He knows that if I need to get a 10 mile run in, he’ll get the kids ready for school. It’s important to me to set a good example for my kids, and to show them the value of a healthy lifestyle. I also always try to have a goal. Recently, it was completing the Rehoboth Beach Seashore Half Marathon. If I don’t have a goal, it’s way too easy to fall back into those old habits. The hardest part is getting started and having the strength to say no to things that do not put yourself first. I love giving back to my community and I’m the first one to get my group of friends together I look at my calendar on a weekly basis and my workouts are on my calendar. If that means I have to say no to something in order to get a run in, I’ll do it. I’ve never called what I’m doing a diet. It’s a lifestyle change and about being comfortable with who you are. It’s all about mindset and not letting anything from the outside world impact me and what I know is right for myself. What advice do you have for others who are embarking on or are in the middle of a fitness journey? If you’re already working toward a healthy lifestyle, keep setting goals. Just because you meet a goal, don’t get comfortable and stay there. People say, “I’ll start my diet tomorrow,” but often that just doesn’t work. Tomorrow will never happen. You have to make the choice to start today.